An abundance of wildlife lives in the marshes at Duck Lake, including such provincial rarities as Leopard Frogs and Forster's Terns. Douglas Leighton. Tucked between the Selkirk and Purcell mountains, the Creston Valley is one of few wide, flat valleys in southern British Columbia. Between the mountains, the mighty Kootenay empties into the deep basin of Kootenay Lake. For millennia, it has overflowed its banks with every spring freshet, dropping its rich silt over the valley floor, creating a 16,000-hectare floodplain around Creston. 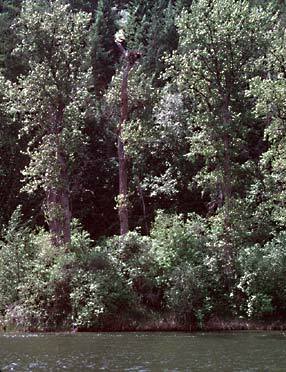 Riverside forests of Black Cottonwood line some reaches of the Kootenay River in the Creston Valley. Sydney Cannings. Marshes and shallow lakes support fish, frogs, waterfowl and dragonflies. Smaller streams tumble in water and nutrients from the mountains. The diversity of streams and rivers, deep and shallow lakes, ponds and marshes make this area an excellent example of British Columbia's many freshwater ecosystems. 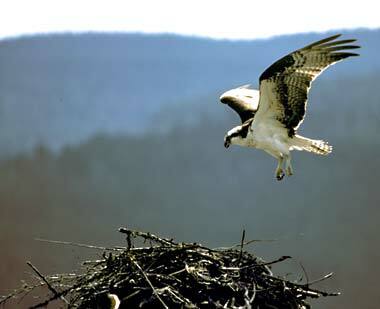 An abundance of shallow-water fish attracts many Ospreys to the Creston Valley. Douglas Leighton. Audio button to hear call of Western Grebe. The valley hosts many migrant birds. About 6,000 Tundra Swans fly through each spring, accompanied by Canada Geese. In the fall, 70,000 waterfowl gather. Fewer remain to breed, but large numbers of Black Terns (450 or so) nest here, and it is the only place where Forster's Terns breed in British Columbia. This valley is home to one of only three breeding colonies of Western Grebes in the province, and the Great Blue Heron colony is the largest in British Columbia's interior region.